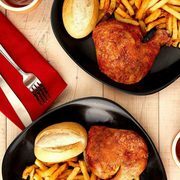 Swiss Chalet Swiss Chalet 2 Can Dine Deals: 2 Quarter Chicken Dinners for $16 (Dine-in) or 2 Quarter Chicken Dinners + App for $20 (Delivery)! 2 Can Dine Deals! Grab a friend and check out these new offers from Swiss Chalet! No coupon is required to take advantage of these offers, as they'll be automatically available in participating restaurants, or will show up on the menu for those ordering online. As always, each quarter chicken dinner will come with dark meat chicken, which can be switched for white meat for an extra $1.80 per entree. Upgrades of sides may be available for an additional charge. These offers are valid through April 28 at participating locations. Click here to order online or click here to find a location near you. When the deal isn't on, I usually buy a half chicken dinner with salad and add fries as an extra. For take out including tax, it comes out to $20 and change. Almost the same as $15.99 deal (add white meat +$1.80 for one of the meals). Only thing you are missing is an extra bun. Also remember to stock up on those PC point card gift card deals and sign up to swiss chalet mail for a free appetizer. When me and the wifey go to eat one always orders water and I order the pepsi helps save money for two people buying drinks as well. The white meat order contains significantly more meat. I think it's worth it to pay for it. What is the PC point gift card deal? Seriously I'd need like 2 of these deals to be satisfied. Especially at Swiss Chalet... I could go to Walmart and buy a box of chalk instead.